met museum, n.y.: ‚hedge two-way mirror walkabout‘, the roof garden commission: dan graham with günther vogt. 29/04 – 02/11/2014. dan graham c/o marian goodman gallery, n.y.
günther vogt: vogt landschaftsarchitekten, zürich. 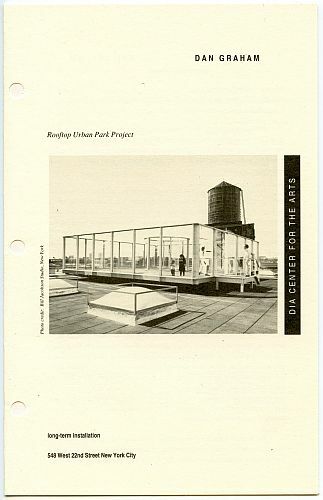 dia center for the arts (on 548 w. 22nd st.), n.y.: ‚rooftop urban park project‚ by dan graham. 12/09/1991 – 11/01/2004. austellung im jenischhaus 06/04 bis 23/11/2014: caspar voght (1752‐1839). weltbürger vor den toren hamburgs. robert smithson, ‚floating island to travel around manhattan island‘, new york, 1970/2005, produced by minetta brook in collaboration with the whitney museum of american art.